We are pleased to announce the release of PlatformIO Core 3.5.0. Depend on development platform using VCS URL (Git, Mercurial and Subversion) instead of a name in Project Configuration File “platformio.ini”. Drop support for *_stage dev/platform names (use VCS URL instead). 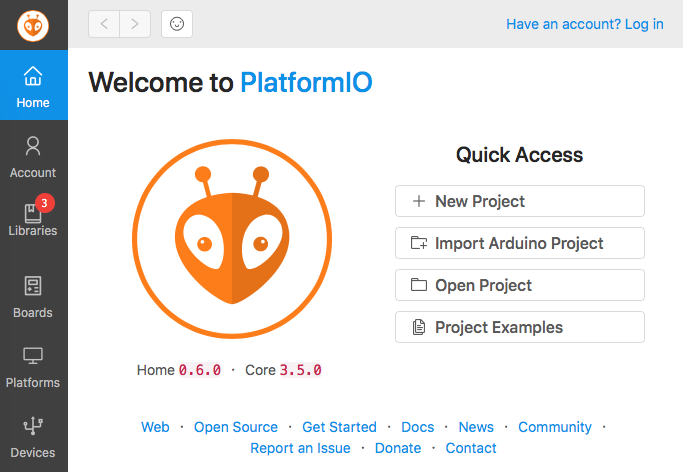 See PlatformIO 3.5 Release Notes for details. This seems to have broken clion development for me, it looks like it tries to add a lot of definitions to CMakeListsPrivate.txt, may of which contain spaces, parens, etc. Fixed in development version and PIO Core 3.5.1 will be released soon. Sorry. Not sure what happened, but windows just did an update.
" The ‘platformio==3.5.1a1’ distribution was not found "
Please remove a folder above and restart IDE. I wish that every problem was so simple to fix.